Chris and Mariesa lived a crazy enough life together, what with a handful of big dogs to wrangle at home. 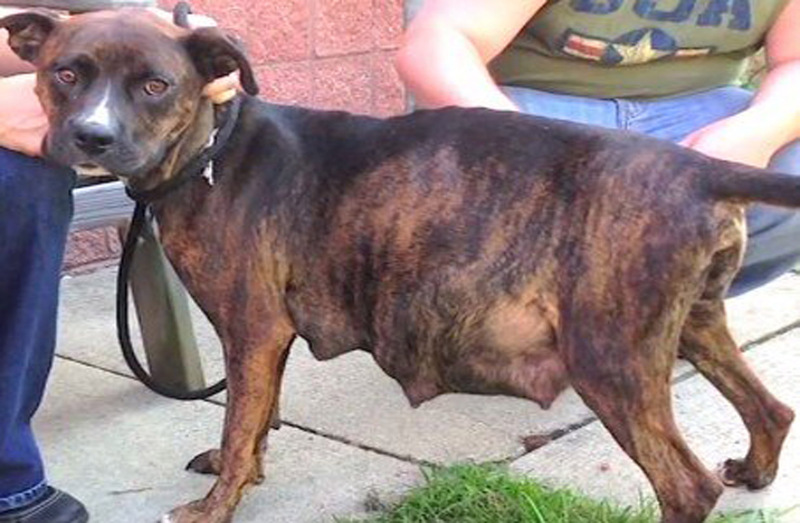 But one day at their county kennel, they came across a pregnant shelter dog named Storie who was pregnant with 12 puppies. “Dogs having puppies at shelters, it’s not the best thing for them. It’s stressful for her, stressful for the puppies,” Chris says. They couldn’t nottake Storie home. Chris and Mariesa decided to foster Storie and provide her with a safe place in which she could deliver and raise her puppies outside the shelter. The kindhearted couple took Storie home, set her up with a comfy bed, and prepared to wait for her to go into labor. They figured they’d meet the dozen puppies in a few days after Storie got acclimated to her foster home. But that night, something incredible happened. Just hours after Storie was removed from the county kennel, she went into labor. All 12 of her babies were delivered only 18 hoursafter she was rescued. Incredible! She was holding out for a miracle, and that’s exactly what she got… just in time. Within two weeks, the puppies started opening their eyes and showing the world their unique personalities. You’d think caring for an additional 13 dogs would be too chaotic to bear, but Chris and Mariesa handled it like pros. Chris and Mariesa would like to thank Pibbles and More Animal Rescue for their help finding new homes for all 12 of Storie’s puppies. As for Storie’s fate, well… you’ll have to watch the video to find out what happened to this amazing momma! Please SHARE this heartwarming tale with your friends on Facebook!